The audience was filled with over 100 people, including a number of celebrities, who claimed to be sexually abused as children. 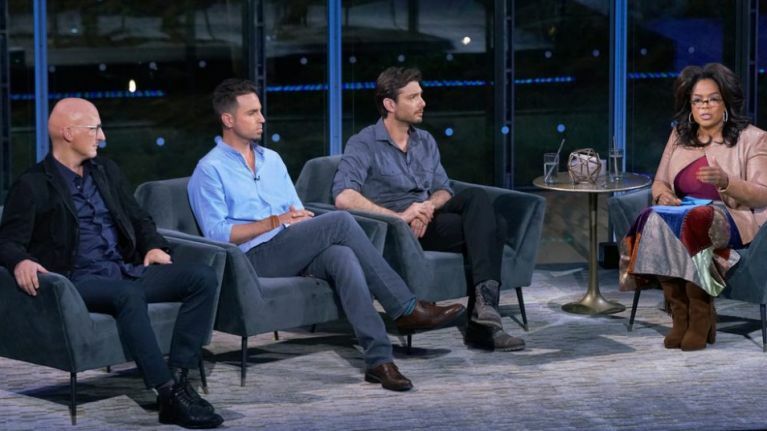 In the minutes following the premiere of the initial screening of Leaving Neverland, Oprah Winfrey hosted an hour-long special interview with the two primary accusers of that documentary, Wade Robson and James Safechuck, as well as the documentary's director Dan Reed. After Neverland is primarily Oprah Winfrey using the focus of Michael Jackson and this specific case to cast a wider net of the sexual abuse of children in general, which goes from churches to sports teams to other famous cases. At the top of the interview, Winfrey states "Here’s the reason why I’m here: In 25 years of The Oprah Show, I taped 217 episodes on sexual abuse. I tried and tried and tried to get the message across to people that sexual abuse was not just abuse; it was also sexual seduction." At the time of writing, the Jackson family have continued to deny all of the allegations and publicly condemned the film, and the Jackson estate is suing HBO for $100 million. Winfrey also brought out Howard R. Fradkin, a psychological trauma consultant specializing in male sexual abuse, to speak about patterns of grooming and manipulation.